The recent wonderful Royal Wedding brought back many memories of Eric when I first knew him. 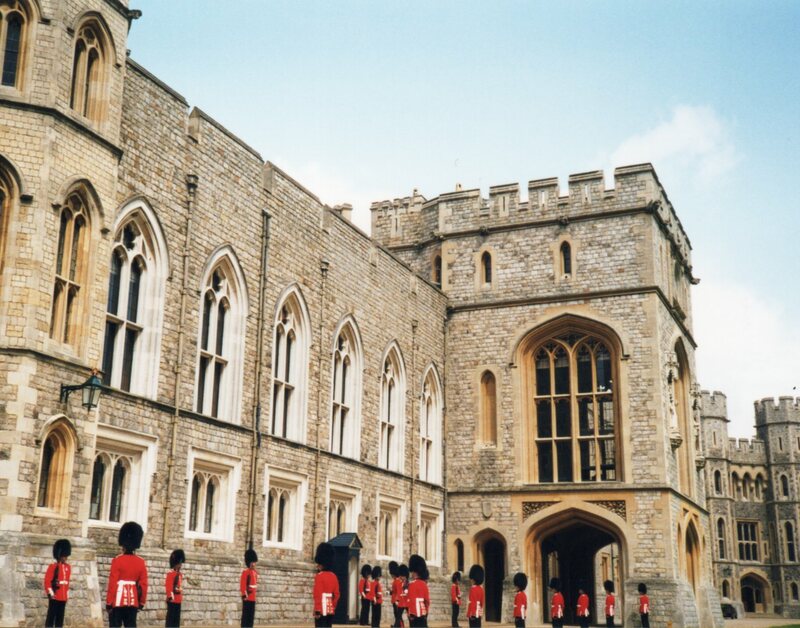 At the end of his working life, he became a warden at Windsor, stationed in various parts of the castle, inside or out, ready to assist visitors and tourists and answer their questions. this new role brought him plenty of fun and laughter in retirement. At that time many of the wardens were army veterans, so during breaks, he enjoyed the camaraderie and interesting conversations relating to their experiences in various campaigns. Eric swiftly became a popular member of staff but needed reprimanding from time to time for his wicked sense of humor which livened up the many hours of standing around. Each warden held ‘walkie-talkie’ equipment so they could communicate with each other, an essential requirement in case a visitor was taken ill, had become separated from their friends or reported a lost item. One morning, the voice of a female warden came through to her colleagues saying ‘Attention, please! A lady has reported the loss of a baby’s pink bootee, so please report back if you find this in your area; over.’ The sound of her voice could be heard by members of the public standing close to wardens, and Eric responded in his best BBC voice ‘Message received; is it a left bootee or right bootee? Over…’. Amongst the laughter of those around him, his colleague could be heard to reply importantly ‘One moment, I’ll ask…’ She was horrified and acutely embarrassed by her stupidity and refused to speak to Eric after that incident! 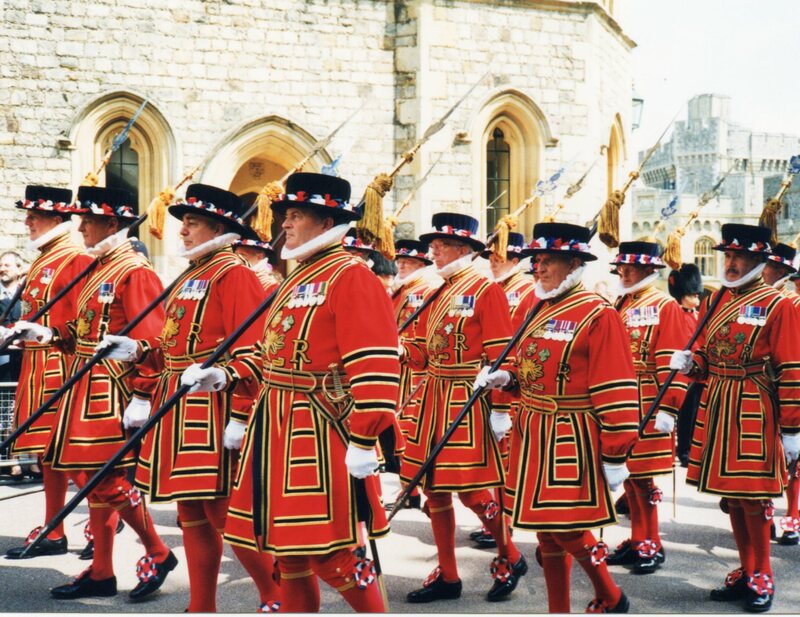 On a day off duty in 1999, Eric took me to the annual Order of the Garter ceremony at the Castle, where people who had been honoured with the title ‘Knights of the Garter’ attended a formal luncheon prior to a service in St. George’s Chapel. It was a glorious sunny day, and Eric stationed us at the top of the hill, in a perfect position to view the dignitaries gathering together ready to parade down the hill to the Chapel. I was absolutely thrilled to see so many famous people within touching distance, and took photos of The Queen & Prince Philip, Prince Charles & Princess Anne, Baroness Margaret Thatcher, Sir Ted Heath and Sir James Callaghan, all of them resplendent in their dazzling robes walking slowly down the hill in pairs towards the Chapel, accompanied by uniformed military officers. That spectacle was a memory to treasure. This entry was posted in Uncategorized and tagged fun and laughter in retirement. Bookmark the permalink.